Finally, the long awaited recipe for kanom krok, the famous little Thai coconut pancakes that are one of the most popular street foods in Thailand! They’re so incredibly tasty that I seek them out every single time I go to Thailand…it’s an absolute must-have for me. They’re made in a pan with iconic round indentations, creating a little cup of goodness that’s crisp on the outside and soft, warm and custardy on the inside. Topped with a variety of toppings from green onions, to corn, to taro, fragrant with the aroma of coconut and jasmine rice…these are easily one of my favourite snacks or desserts in Thailand that’s also easy to make if you know the right techniques! NOTE: If you haven’t seen my video on How to Choose the Best Coconut Milk, please take some time to watch it. 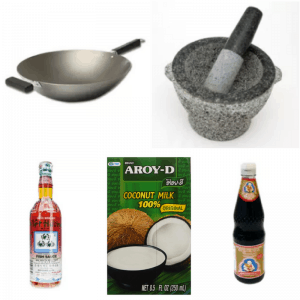 This recipe depends SO much on the quality of your coconut milk, and it will not be delicious if you’re using low quality brands. The coconut milk I recommend can also be purchased online right here if you cannot find it in your local store. If you live in Thailand or any other country where fresh coconut milk can be made easily, this is the time to do it! About the Kanom Krok Pan I used: As mentioned in the video, I got this pan online from Amazon (available on both Amazon US and Canada). It is a pan made for takoyaki, which I find is the best size for kanom krok. I forgot to mention it also comes with 2 other interchangeable skillets, one is just a plain flat skillet (super useful) and another on that has 4 big circular holes (for whoopie pies?) It was really inexpensive and works fantastically. Check out the pan on my Kit here. Most importantly this pan has a temperature control knob, which makes a huge difference in how you’re able to control the doneness and speed of cooking of the pancakes. I’m using an electric pan, but you can also buy pans that are meant for stove top. I would imagine that they would not work well if you have flat electric burners because you wouldn’t have enough contact surface with the pan. But if you have gas stoves, it’s a good option for sure. Danish Aebleskiver pans will also work but I find them too big, so if you do use is, make sure you only fill it half way. It’s not just about them being little and cute, though that’s a bonus, but using a pan that is too big will alter the shell-to-filling ratio and it won’t be as good. You will have less crispy bottom for the amount of soft filling! If the pan you use is cast iron, make sure it’s well-seasoned or the batter will stick to the pan! 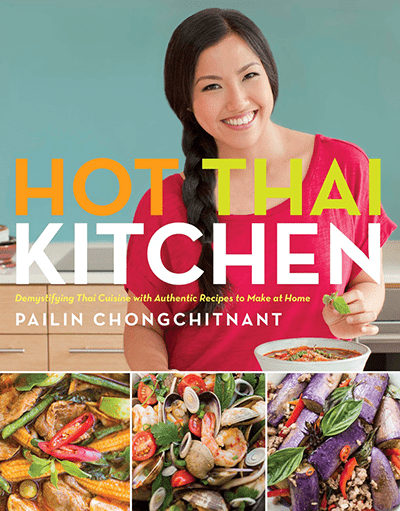 What about real Thai kanom krok pans? It will likely be too big for home burners, but if you do find a smaller size, it will need to be seasoned before using or the batter will stick! Thai people do this by stuffing the holes with shredded coconut (fresh, not dried) and then putting it over flame for several hours, letting the coconut burn in the holes. The oil from the coconut will come out and coat the holes and season it. Coconut oil for greasing the pan, this will give extra coconut aroma, but you can use neutral flavoured oil if you don’t have it. Chopped green onions (this is the most classic), cooked sweet corn, cooked taro cubes, or feel free to experiment with other toppings! Whisk the rice flour, sugar and salt together until there are no more clumps of flour. Add coconut milk and whisk until sugar is dissolved. Easy peasy! *Both batters can be made in advance and stored in the fridge. Bring it out to room temp before using. If the shell batter has thickened up too much, you can add a bit of water to thin it out so it pours easily. The batter should have a runny consistency as shown in the video. Prepare toppings and a cooling rack. Heat the pan at 325°F. To test pan for readiness, sprinkle a bit of water onto the pan, and if it sizzles away immediately it’s hot enough. Brush half the holes with coconut oil. I like to make only half a pan at a time in the beginning because you’ll likely be a bit slow and clumsy to start, and it’s just more manageable and less hectic to deal with a few at a time. Add ½ Tbsp of the shell batter into the pre-heated holes. Then add 1 tsp of the filling by dunking the teaspoon right into the middle of the shell and wiggle it slightly (see video for this technique). Let them cook for a minute or so, meanwhile, fill the rest of the pan. After a minute or two of cooking, the cakes should be partially set, go ahead and add your toppings. If you’re using heavier toppings like corn or taro, and they sink too much into the cakes, just let the cakes set a bit more before topping. Continue to let them cook until the bottom is crispy and golden brown, and the top is no longer runny, about 5 mins. Give them at least 5 minutes to cook, do not rush them, that is how you get crispy bottoms. If the bottom is done but the top still needs more cooking, you can cover the pan with a pot lid to steam the top for 1 minute. To test doneness, tilt the pan slightly, and if the top doesn’t run, then it’s done. Tips: Feel free to adjust the temperature of the pan as needed during the cooking process. Remove the cakes by pushing them up with a toothpick or skewer, and scooping them out with a spoon. Place on a rack to cool for a few minutes just so you don’t burn yourself, but you want to eat these while they’re still warm and crispy. These do NOT keep well as they go mushy and soggy real fast!! Note: I’m only using the toothpick to push the cakes up because I don’t want to scratch the nonstick pan with the spoon, but if you’re using cast iron, you can just use the spoon alone. Kind of… It’s best to make only as much as you will eat, especially since the batter will keep in the fridge. But if you’ve accidentally made too much or people are taking too long to eat them and they’ve cooled down, they can be popped back into the pans to warm up and recrisp the bottom. However, they will end up dryer and not as luscious as they once were because they’ve been cooked twice, but I guess it’s better than throwing them away!